Imagine spending more time outside, getting fresh air, and doing it without leaving your home. With the right backyard landscape design, you can turn your home into an incredible hangout spot for any season. Here are six ideas for your backyard that an innovative landscape contractor can add that you, your family, and your friends will love. If you want to spread your living space to the backyard, get a landscape company to install a patio. With a beautiful new patio, that an expert in landscape design creates just for you, there are so many options. Now you have a new way to enjoy the first warm days of spring. Patios create an area to grill outside, enjoy a fire pit in the fall, and make your social engagements more enjoyable for everyone. Bringing in a landscape contractor to build you a deck will dramatically improve your backyard landscape design. Whether you are building a deck out from the second story of a building on a hill, or you have a simple short deck with great style, it is guaranteed to make your hangout space spectacular. With a deck addition, you improve your property value and you can have a completely customized style. Just do a little research on what you like ahead of time and find the landscape company that can create what you want. Are You Ready for a Pool Party? This is the classic American backyard improvement. Having a swimming pool in your backyard makes every summer memorable. Your landscape design is automatically improved, and who does not like swimming or laying out by the pool. A landscape contractor can also help you build an incredible pool deck to make the whole area truly special. One of the things that can make a dinner party stressful is a lack of space. 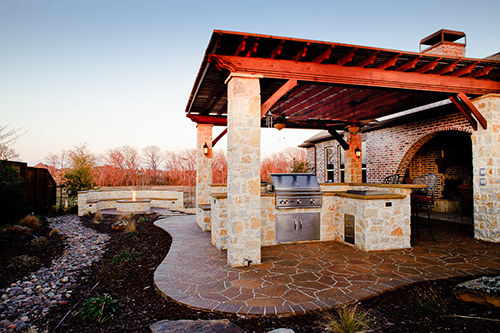 A landscape company can help you install a spacious outdoor kitchen, where you are not cramped inside with guests. It also will keep you from spending more on energy cooling your home while you cook. This is a simple way to improve your landscape design and make everyone in your household and all of your friends more comfortable. Why Not Create an Entire Outdoor Living Area? Make your outdoor landscape design friendly for kids and adults alike with an outdoor living area. When the weather is nice, you can have a place to sit and chat, while the kids play in the pool or the backyard. With advancements in outdoor furniture and creative designs, this is a great route to go. One thing that any landscape contractor will tell you is that you greatly improve your outdoor space with great lighting, Make sure that you can spend the evenings outside with the proper lighting that does not blind you but also does not leave you in the dark.